So, you’ve been juicing for quite some time now, done a few short cleanses, enjoyed their fabulous effects on your health, and now are feeling ready to take a step further, for some deeper detox. This 8 to 14-day detox/juice cleanse might be the perfect next step for you! It provides a substantially deeper cleansing than short detox plans but is still easier to do than embarking on monumental juicing journeys such as that beyond 21 days. Medium-duration juice cleanses are great to do on vacations but that’s not necessarily required: by now, you’re most likely seasoned enough to do juice cleanses without disrupting your routine life flow. Now let’s check out the interesting details of your 8 to 14-day juice cleanse! An 8 to 14-day juice cleanse is perfect to flush out most of the toxins from your body AND start healing minor to moderate health issues. Most likely, if you suffer from some chronic diseases you will start noticing significant improvements in your condition—but a full-blown reversal of the pathology would still require a longer detox plan. As a rule, autoimmune conditions such as psoriasis and certain types of arthritis start to soothe down after 2 full weeks of juice cleansing, often leading to a quite long period of remission. For most people, however, such a cleanse won’t be enough to reverse the process itself—just to provide a solid yet temporary improvement. This 8 to 14-day juice cleanse is NOT for beginners. If you are new to juicing, start slow. Start with drinking fresh juices regularly for a few weeks, then try out with 1 or 2-day fasts, building yourself up to 7-day juice fasts. 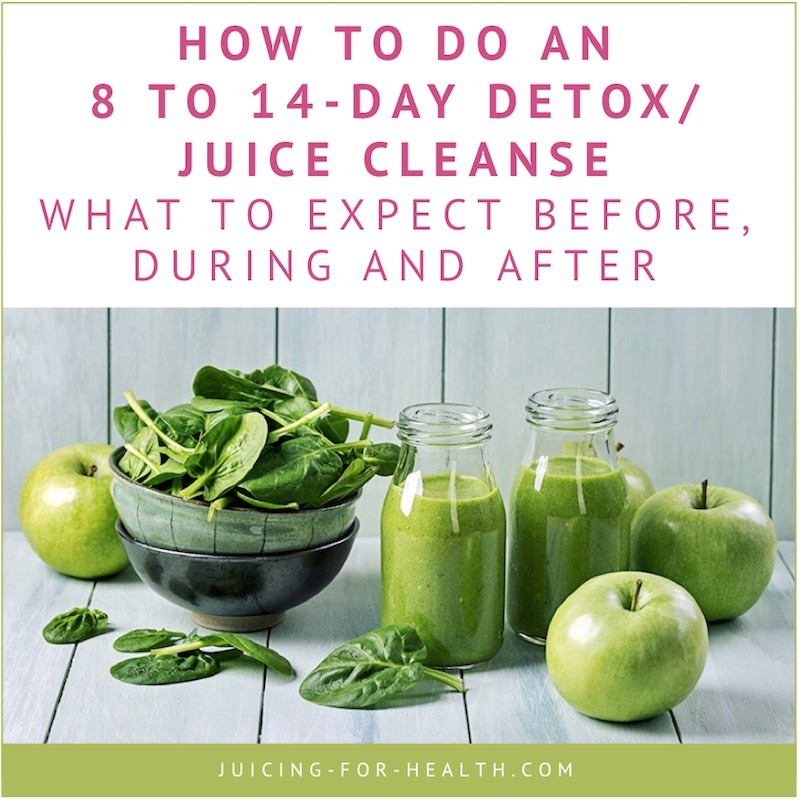 Once you have enough experience at these stages, and have accustomed your body to juice cleanses, then you are ready for a two-week juice cleanse! The second week of detox, although generally easier on the body, might evoke long-forgotten sensations and emotions related to old injuries, traumas, operations, and diseases. Be ready for this, and remember that any unpleasant health reactions are temporary. Please read the 7-day detox/juice cleanse that will lead you up to this 14-day cleanse. Particularly note, that you should start with a gastrointestinal cleanse. Also go on a parasite cleanse that will enhance your detox efforts, superboosting your healing. Make sure to have at least 8 hours of sleep every night as this is when detox processes are most effective in the body. During the second week you may occasionally feel more tired on some days: try to get some extra sleep—these are signs that your body is detoxifying some deep, old damage. Don’t fight these feelings of tiredness, let it rest. It is generally recommended to take a break from any supplements during your detox program except for 30-50 billion count probiotics and omega-3 fish oil or flaxseed oil. If you’re doing the gastrointestinal cleanse and/or the parasite cleanse, then follow those protocols where supplements are concerned. Most of the toxins from your body will be flushed out during the first week of detox, so the second week will be marked by far less intense healing reactions and much higher energy levels. If you are overweight, however, some of the healing reactions might persist during the second week as a lot of toxins are deposited in body fat and would require more time to be flushed out. The second week is also the time when your body starts “digging deeper” into its organs and tissues, repairing old damage (from traumas, operations, and diseases) that had not been properly healed before. Toxins that have been previously deposited in scar tissue and bone fractures (if any) are gradually released into the bloodstream, ready to be eliminated once and for all. A common sign of this process is experiencing the same pain and other symptoms that you had when the original trauma or disease took place. Keep juicing and drink plenty of water to speed up the cleansing. For most people, enemas prove to bring relief as well. As with any detox you do, the main piece of advice I always say, is to listen to your body. The second week of your juice cleanse is likely to be much easier on your body than the first one, but for many people it still remains a challenge not to be underestimated (especially if this is your first two-week cleanse). In general, aim to get yourself a good portion (about 17-27 ounces or 500 to 800 ml) of freshly made juices three times a day for traditional “meal times” (breakfast, lunch, dinner) with occasional sips of juice or broth in between meals whenever you feel like it. This amount is not a hard and fast rule, it is a guide. Drink as much as your body can comfortably handle. In between your meals, feel free to drink more juices, broths and caffeine-free herbal teas whenever you feel like it. The idea is to continue to flood your body with the good stuff, and not get hungry. Here are some ideas of what you can drink, on top of your juices. At this stage of your juice cleanse, the detox processes will be taking place at a much deeper level, so it will be extremely important to ensure optimal hydration and aid the cleansing process as much as possible. Aim for at least 70 ounces (2 liters) of water on top of your juices and broth. 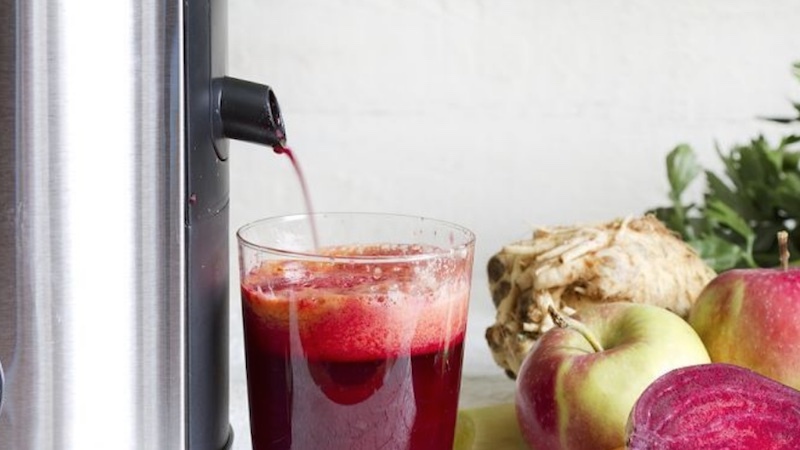 Slow and steady, that’s how you do an 8 to 14-day juice detox. There’s less need for metabolism-boosting ingredients now (ginger, turmeric, etc.) as you’ll have more time for the cleansing to be carried out—so get creative! Two weeks is a whole lot of time to indulge in your wildest juicing experiments and try something new, unexpected, and radiating with health. By this time, you may be able to include beetroots into most of your juices for a good cleansing and support of your liver. However, still keep a focus most of the time on green juices that are most healing for your digestive system, and for healing and repair of diseased and damaged tissues/cells. Always use organic, if possible, unless you’re using a slow juicer that can help minimize the inclusion of artificial chemicals in your juice. You may notice that I often include lemon and ginger root in all my juices. These are my staple. The lemon is a wonderful citrus fruit that does a few things when added to any juice. It enhances nutrient absorption in your body by up to 5x, making your juices go a longer way to feed your cells. Lemon superboosts your immune system, and improve the taste of your juices. Always use organic lemons, and include the peel (cut off both ends). It is the bioflavonoids in the peel that do these miraculous healing. Ginger root on the other hand, gives the juice an extra “kick” in the taste, improves blood flow and strengthens your guy and immune system. You may use more than the recommended one-inch, if you like a little spiciness in your juice. In general, aim to get as much of greens as you can (while still feeling comfortable and healthy), but feel free to spice them up with a dose of fruits. Pineapples, apples, and carrots are usually the best ones when it comes to combining them with greens. Get more tips on making great-tasting green juices. But, it’s your adventure, have fun!